Majors Home Improvement is proud to install sunrooms for homeowners in Pensacola, Florida, and all surrounding communities from one of the top manufacturers in the business, TEMO. Since 1997, we have been providing homeowners throughout the area with quality home improvement products, professional installations from a team of highly trained technicians, and superb customer service from beginning to end. And, it’s due to this dedication to our customers’ satisfaction that we have maintained an A+ rating with the Better Business Bureau for many years. 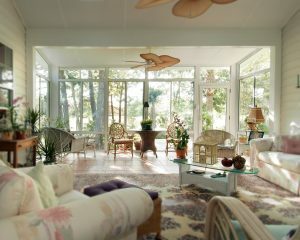 Sunrooms are an ideal upgrade for homes in the Panhandle area. These additions provide homeowners with a beautiful area in which to better enjoy the outdoors where they won’t have to contend with pesky bugs, harmful UV rays, or the threat of inclement weather disrupting their time. Our experts will work closely with you to help you find the style that will complement your home’s architecture beautifully. And, you can count on a highly durable product when you have us install one of our TEMO sunrooms at your home. Your sunroom will come equipped with exclusive TEMKOR interior/exterior surfacing that protects against damage, an expanded polystyrene roof that provides thermal protection, and vinyl insulated windows that offer incredible energy efficiency. To learn more about our sunrooms, contact Majors Home Improvement today. We are proud to serve homeowners in Pensacola and all surrounding FL cities.